Earlier this week, we called out a Mobile World Congress Shanghai panel and presentation focused on network virtualization. Outside the conference sessions, we can debate how big the event truly was; it’s unclear how many people came to see smartphone cases (and smartphones) vs. cutting-edge network R&D. What is clear, however, is that the networks R&D and deployments that seemed most visible (in announcements and show floor exhibits) were focused on the RAN. Given the dominant role that the RAN plays in operator CapEx, this focus wasn’t surprising – neither were the RAN themes on display at the event, with a few exceptions. — 5G. It seems near-impossible to attend any wireless conference circa 2015 without 5G being a major theme; Mobile World Congress Shanghai was no different. Ericsson talked up its work with Softbank, Turkcell and METIS-II. Huawei talked up its work with the 5GPPP and 4.5G/5G small cell innovations. And, of course, there was plenty of work on 5G below 6 GHz, including Nokia’s work with DoCoMo and the “FANTSTIC-5G” launch coming a week before the show. — LTE TDD. Where Japan and China have led the way on LTE TDD, it only made sense for vendors to show up at MWC Shanghai ready to talk up the technology. That probably explains why we saw two “TDD+” launches (Huawei, ZTE), not to mention a solid number of TDD-based showcase deployments alongside leading operators: Nokia with China Mobile and 3.5 GHz spectrum, Nokia with Shanghai Mobile and small-cell carrier aggregation, Huawei with 3 Hong Kong and TDD-FDD carrier aggregation. — Massive, Massive MIMO. My colleague Ed Gubbins recently wrote about massive MIMO as one component of ZTE’s pre-5G strategy. Part of the strategy includes trials of a 128-antenna element eNodeB. Pictured here, all base station components are integrated into one unit to accommodate the massive process requirements implied by the massive MIMO array. Sure enough, China Mobile had the base station on display in its stand. While it’s always nice to see operators supporting new RAN innovations, it’s also clear that this level of massive MIMO plays to the show’s TDD focus noted earlier. — Small Cells Everywhere. Small-cell solutions were well represented at Mobile World Congress Shanghai. Why? Take your pick: the region’s capacity and coverage demands; solid fiber availability in key markets like China, Japan and South Korea; siting efficiencies in markets like China (where municipal roadblocks might be easily sidestepped). More interesting than the small cells themselves were the non-traditional RAN players in attendance to sell their small-cell solutions. You might see vendors like Datang and Comba outside Asia from time to time, but not very often. As much as this points to Asian small-cell opportunity, it also speaks to the ability of a wide array of vendors to build small cell solutions efficiently from readily available components and software stacks and target regional or local demands. Of course, tailoring solutions to unique operator requirements is a dynamic that’s not limited to Asia. — Drones + LTE = Instant Crowds. If a prize were given out for the most visitors per exhibit floor booth investment, it would likely go to BaiCells. Its tiny booth at the edge of Hall 5 was usually packed or at least busy. What was everyone there to see? For some, it was an end-to-end (device and AP) LTE-U system. For most, it was likely the small-cell integrated drone, a copter sporting an LTE base station. To be sure, the use cases for a flying base station (with a naturally limited flying time) are limited. Where small-cell pioneers hoped to see innovative deployment models spring forth as the market matured, the example of BaiCells is a good one. 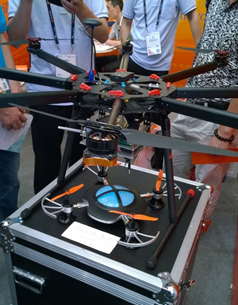 Mobile World Congress Shanghai certainly delivered in terms of putting diverse, engaging RAN technologies on display. The fact that some key themes included solid representation from smaller vendors points to an inherent industry tension; small vendors are important for innovation, but as they innovate, it’s incumbent on larger vendors to re-affirm their own value. An ability to roll out cutting edge R&D like massive MIMO (the type of solution that requires a lot of money to develop) may be one differentiator. Since operators are looking to deploy workable networks and not just point products, a focus on product reliability, end-to-end solutions and roll out support may be more important.